Starting woodworking can seem like a daunting task, and it's not made any easier by the huge array of tools out there. In this guide to the basic toolkit, we are going right back to basics with a feature each month focusing on the basic requirements for starting woodworking. To start with measuring and marking. All of this equipment is available from Tilgear. 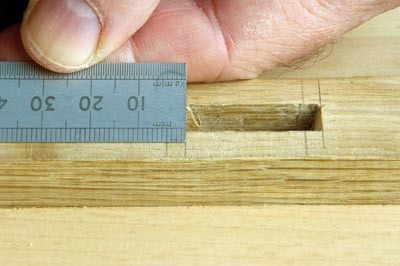 Most woodworking problems are due to errors in marking and measuring. And most of these errors happen from using the wrong measuring instrument for the wrong job. A tape measure is OK for basic DIY but just wasn't designed for the accuracy many woodworking projects require. If you have ever tried marking up very accurately from a tape measure, you know getting a clearly defined mark in the right spot can be a challenge. For the basic toolkit, a steel rule (see photo 1) a carpenters folding rule, and yes, a tape measure (but only for those jobs that do not require exact marking up), will suffice. 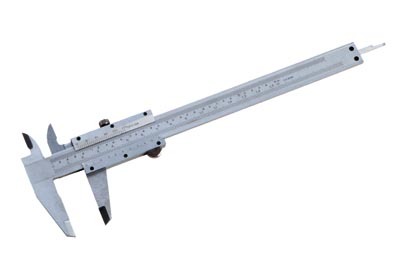 For even more accurate measuring on small distances, vernier calipers (see photo 2) are very accurate and quick and especially handy for measuring thicknesses and rebate widths and depths. And to complement your measuring gear don't forget a straightedge. 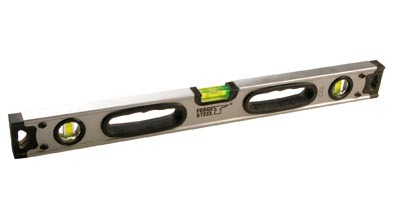 For a basic kit a long spirit level (see photo 3) will do the trick, and will help in all those leveling jobs for putting up shelves. You should consider getting a dedicated and very long straightedge if you plan on making larger jobs. Squares ensure right angles can be marked up accurately. In a woodshop, these things might be the edge of a board, the shoulder of a tenon, the fence on a jointer and so on. 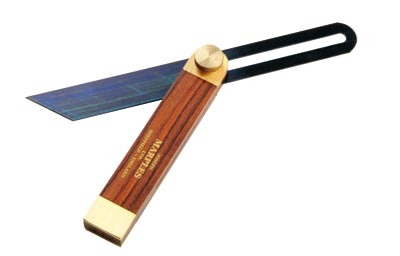 Try squares (see photo 4) have blades of brass which are set in a thicker wood or metal stock. If the stock is wood, it should be faced with metal to ensure long-term accuracy. The reliability of try squares can vary sharply. So when buying, always check the various squares on offer against each other. You can always draw a line from one side of a board, and then reverse the square to see if it matches up. If it does it has to be a true 90 degrees. The combination square (see photo 5) is a fantastic tool for the job, with its 90 and 45 degree angles, and an incorporated spirit level, if you only own one square, then this should be it. The moveable blade is also very handy for measuring the depth of rebates, (see photo 6) and even for marking up along timber edges. 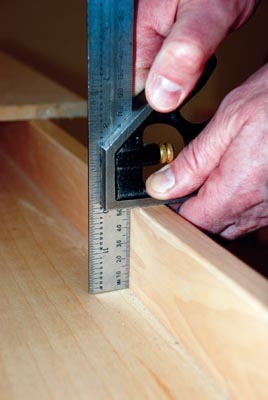 For marking angles other than 90 or 45 degrees, most woodworkers use a sliding bevel or T-bevel (see photo 7). The sliding blade of the T-bevel is infinitely variable and gives the four possible handle-to-blade orientations when the tool is set. Always look for one that has a good lock down mechanism so the blade cannot accidentally move. To measure an angle (the T bevel only sets an angle but doesn't tell you what it is) you need a protractor, and in conjunction with a good T-bevel, you will be able to both mark out angles, and measure existing angles. 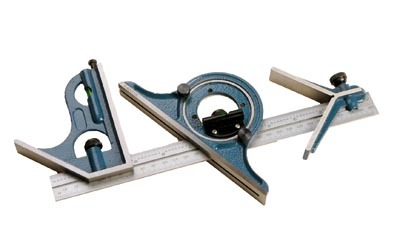 The Incra protractor (see photo 8) available in the Tilgear catalogue, is especially useful. The protactor itself has slots cut through out at very fine intervals, so the lead of the clutch pencil they provide you with locates in these holes, making it much easier to mark out the desired angle. You have a few choices when it comes to basic marking out. Every woodworker needs pencils for drawing up designs, marking timber for joints, position, length... the list is endless. A square carpenter's pencil is very handy and can be bought in most tool shops. Being square means it will not role off your bench! 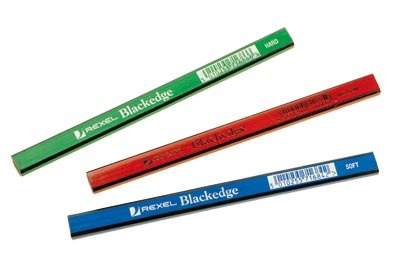 Carpenter's pencils come in three colours: green, red and blue, which are hard, medium and soft leaded, respectively. Obviously choose the grade of lead for the job you are doing: hard for fine cabinet making, and blue for marking up sawn timber (see photo 9). Knives are an alternative, and for the purists, superior way of marking up (see photo 10). 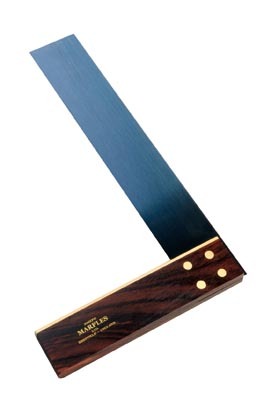 Many woodworkers prefer them, as they give a thinner more accurate line than a pencil, and the mark will not rub off. The knife is also handy because when marking across the grain, the wood fibres are cut by the knife, therefore creating a very clean edge for any subsequent cuts, if you can cut out accurately enough to hit the knife line, that is. The awl (a sharp, pointed instrument rather like a small screwdriver) has a variety of uses. A fine-pointed awl is useful for marking out, rather like a knife. A thick-shanked, broad-pointed awl is good for making pilot holes in wood prior to drilling. The dimple it leaves when tapped with a mallet can form the exact starting point for the drill bit as well. Marking gauges are used to mark a line parallel to a straightedge. Better quality gauges have brass inserts at the front of the stock. These help reduce wear on the stock as it is pushed along the wood and prolong the working life of the gauge. 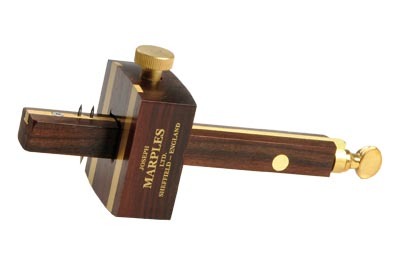 Another variation of the marking guage is the mortise marking gauge (see photo 11). This has two pins to scribe both sides of a mortise and the tenon. Some mortise gauges, called combination mortise gauges, have single pin on the other side so you can use it as a regular marking gauge, and other types allow you to retract one pin into the fence, for the same reason. 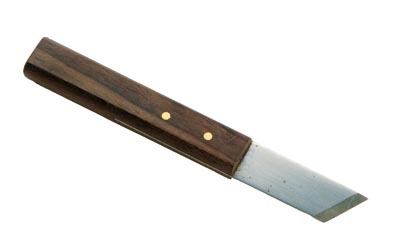 A cutting gauge is a marking gauge with a knife instead of a pin. They really come into their own with really delicate operations, such as dealing with veneers. Primarily used for checking and transfering measurements, dividers (see photo 12) are also a very useful addition to any basic toolkit. The Tilgear catalogue has a number to choose from. You will also need a good compass for marking large circles or curves. 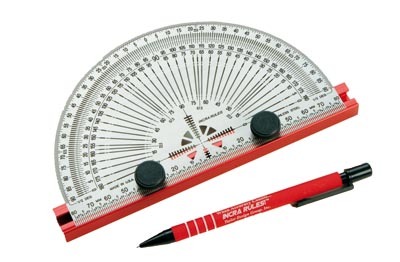 A pencil compass, or combination pencil/scribing compass, comes in very handy for this. If you are marking a non-circular curve, then investing in a flexible curve rule is worthwhile, or indeed a set of French curves. A useful device is a profile gauge. Tilgear stock the Diatec 5in Profile Gauge. This is a great tool if you need to reproduce a moulding. Simple push the prongs of the device against the profile you are measuring, and it flows around the moulding to give an accurate template of that profile for you to reproduce later. Do not forget once you have correctly marked up a piece of timber, use that as the template for all identical pieces which is much quicker and there is less danger of error. If you have trouble seeing a scribed line, take a very sharp pencil, place the point in the scribed line at a slight angle to the wood and pull it along the scribed line. Let the scribe guide the pencil. This will leave a little lead on both edges of the scribe so you can see it better. "Most woodworking problems are due to errors in marking and measuring."